Just a quick post on Christmas Eve to wish everyone out there a joyous holiday season – whether you celebrate Christmas, Kwanzaa, or you’ve already celebrated Hanukkah. 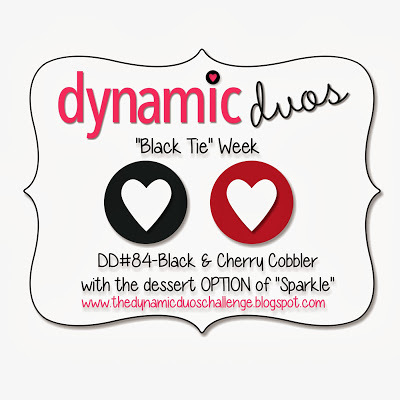 Today’s card features this week’s Dynamic Duos colors of black and cherry red. I will admit I’ve used this layout several times in the past; it’s one of the first several OWH Stars & Stamps sketch challenge layouts. 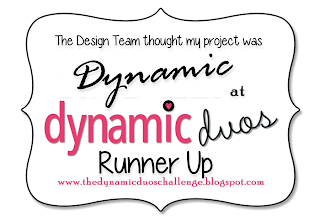 Edited to add: Thank you to Cindy B. of the Dynamic Duos Design Team for choosing my card as a Dynamic Runner Up for the week! If you’re like me, you’ve been seeing a lot of Christmasy and wintry creations online lately, or even still finishing up some of those projects yourself! Today I felt the need for a little visual break from it. 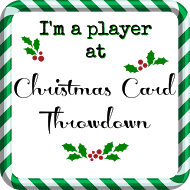 I figured if people do “Christmas in July”, why not do something summery in December? 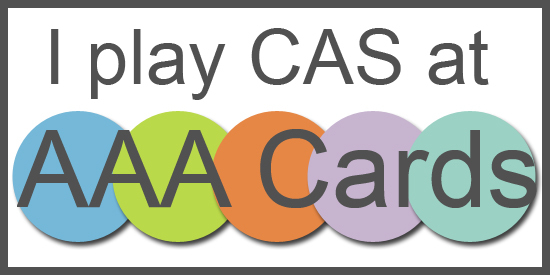 The current CAS(E) this Sketch and Dynamic Duos challenges easily lent themselves to my way of thinking. Since I had the supplies out, I went ahead and made two very similar cards. 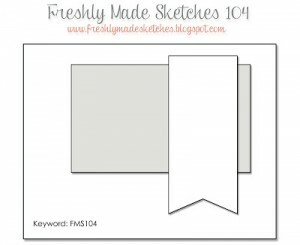 The first one follows the sketch challenge more closely than the second one. The designer paper is some old stuff I bought back when I did more scrapbooking than cardmaking – I would guess that it’s close to 10 years old. Yes, really. 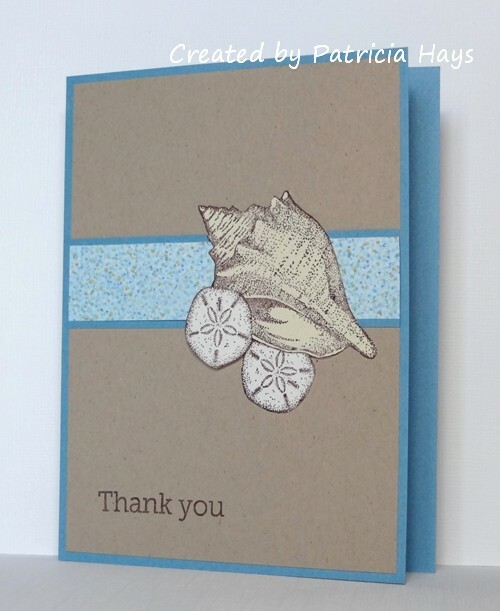 One of the sand dollars on each card is popped up with dimensional adhesive. I’m going to be sending both of these cards off to Operation Write Home. 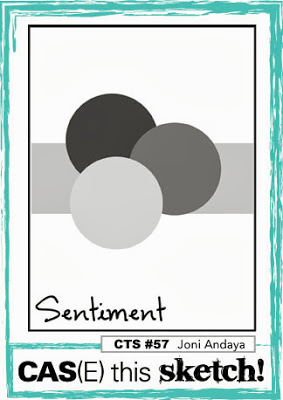 Although I suppose these cards really could be gender neutral, I’m going to link them to the December OWH/Our Daily Bread Designs challenge for masculine cards. Posted by PH in VA at 10:00 pm Cards, CAS(E) this Sketch!, Dynamic Duos, Operation Write Home, Stampin' Up! 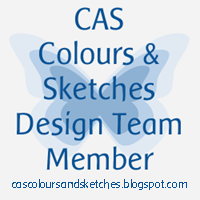 Here’s a quick card I put together, combining the sketch from CAS(E) this Sketch! 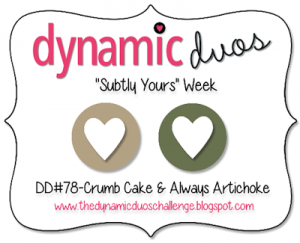 with the colors from Dynamic Duos and the theme from the OWH Stars & Stamps Midweek Throwdown. This is almost a one-layer card. 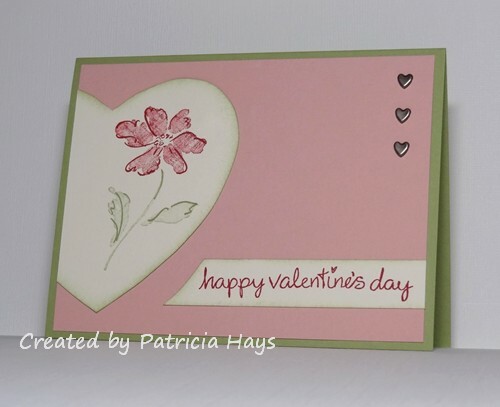 The sentiment is stamped directly on the card base, but the floral stamping is on a separate panel. 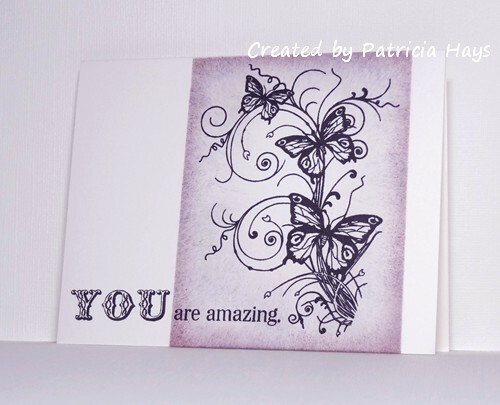 The lighter shades of ink were created by stamping off onto a scrap piece of paper. I added a bit of sponging around the edge of the triangular panel to help set it off visually from the card base. This card will be sent to Operation Write Home. 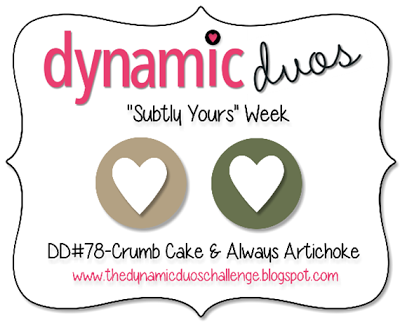 Hopefully one of our military heroes stationed overseas will enjoy sending it home to someone he or she loves. Thanks for stopping by today! As always, comments are welcome and appreciated! This week’s color combo at Dynamic Duos was to pair Midnight Muse with a color of my own choosing. I’ve been meaning to make some more AnyHero cards for Operation Write Home, so I chose a deep red to go along with the dark blue, and added white and another neutral, for a different take on the patriotic red, white and blue. 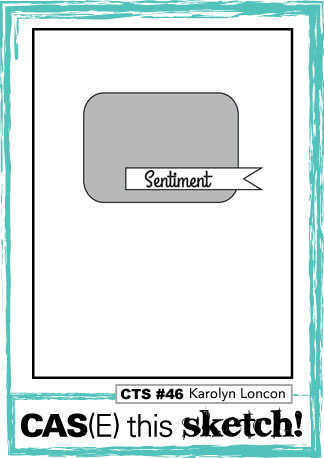 The layout for this card is from this week’s Freshly Made Sketches challenge; I’ve added a banner so the sentiment would show off against the card base. Now I just need to write a note in it, thanking one of our service members for the work he or she is doing to help make our world a better place. Hello! Yes, I know it seems strange to be sharing a valentine today when most people in the United States are thinking of Thanksgiving turkey and stuffing and pumpkin pie. 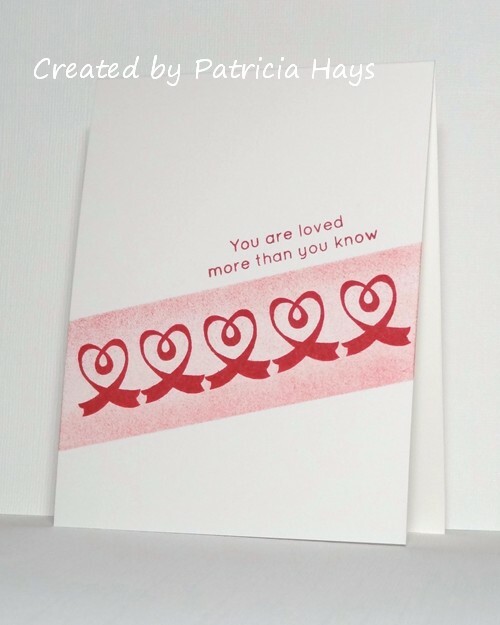 But valentines need to be sent to Operation Write Home by the end of December so that they can be shipped out to the troops stationed overseas, and our military men and women can have time to write in them and send them home to their loved ones by February. 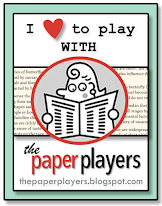 Today’s card is going into my valentine stash for OWH. I’ve used this week’s Dynamic Duos colors and tweaked one of my own cards from 2007. 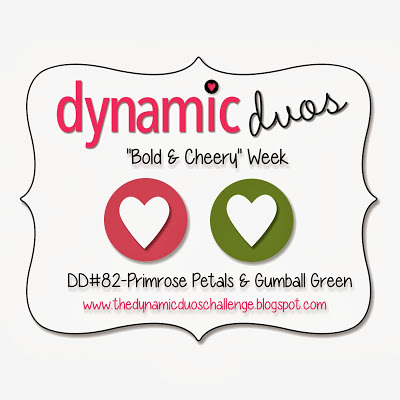 This time the Dynamic Duos crew added a third color to the challenge. The colors suggested “flowers” to me, so I’ve used a fairly large one on my card. 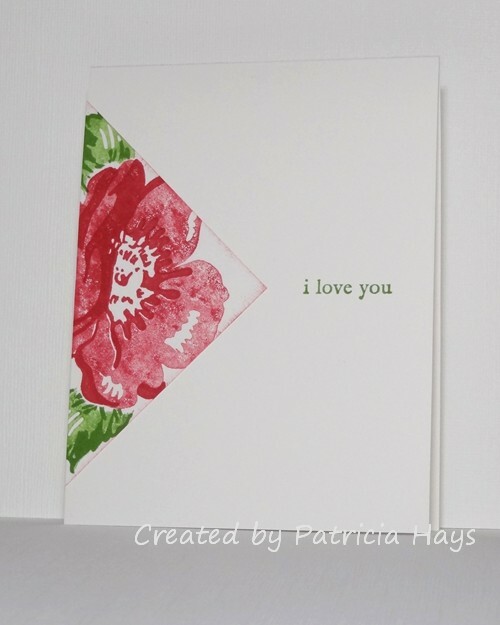 After I got started with this idea I remembered I don’t have any large heart-shaped dies. (Note to self – put “heart shaped dies” on Christmas list.) So I traced around a cookie cutter to get my heart shape and then cut it with scissors. 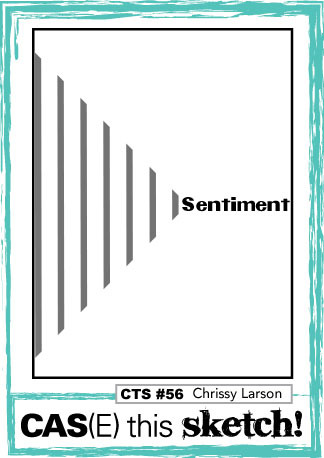 I trimmed the end of the sentiment panel to follow the contour of the heart so that the shapes wouldn’t compete too much against each other. A trio of heart shaped mini brads finishes off the card. That’s it for today! Thanks for stopping by! 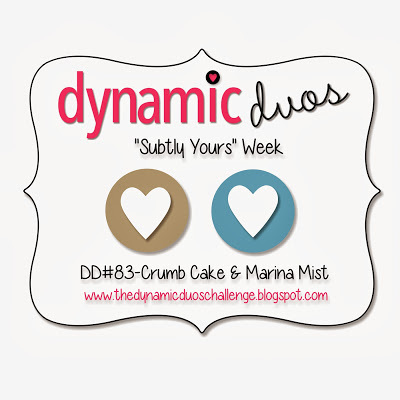 Posted by PH in VA at 8:00 pm Cards, Dynamic Duos, Lawn Fawn, Operation Write Home, Stampin' Up! 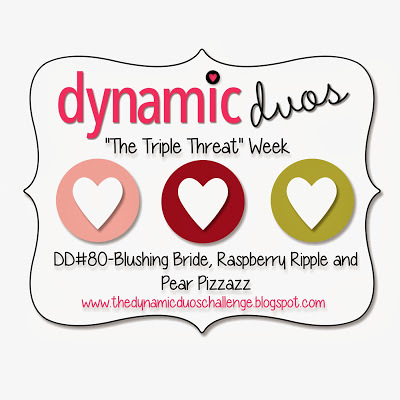 Today’s card combines the current Dynamic Duos color challenge with the current Seize the Sketch sketch challenge. 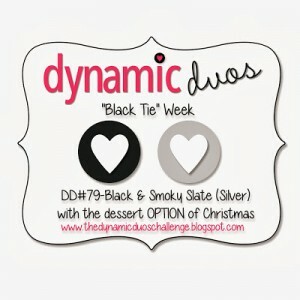 I’ve used these challenges to create another winter themed card for Operation Write Home. 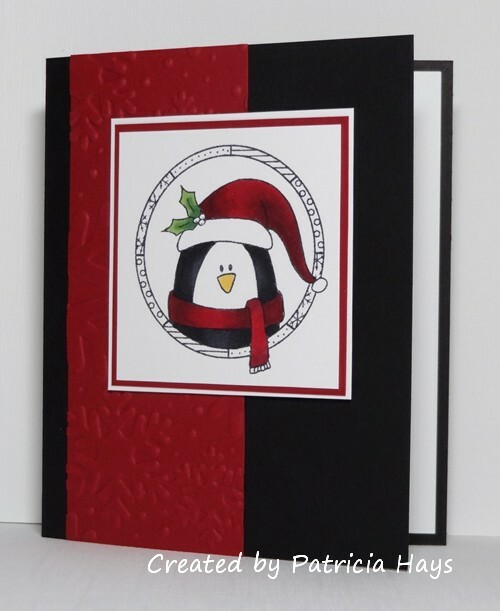 The snowman was heat embossed on a scrap piece of cardstock and then fussy cut. 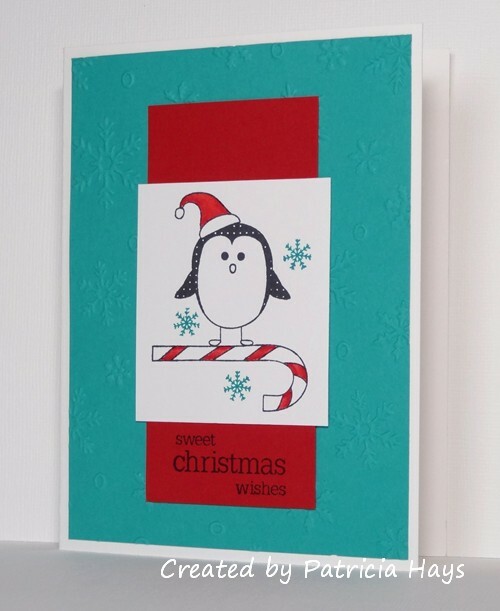 He’s raised up a bit from the background to add a little dimension to the card. The photo doesn’t show it, but the black cardstock has a very subtle linen texture. 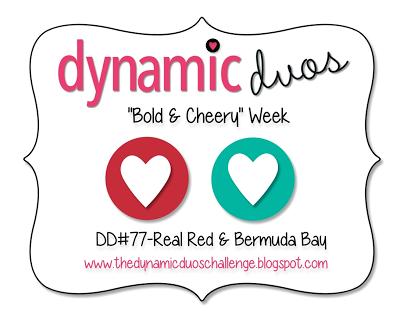 Here’s what I came up with for this week’s Dynamic Duos color challenge. When I saw this week’s colors in their challenge graphic I knew I wanted to do something with trees. 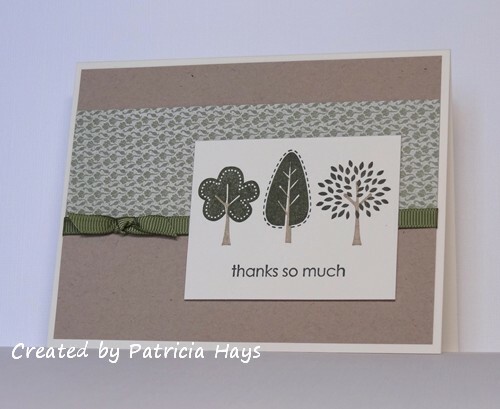 The hard part was deciding which tree image(s) to use, and then figuring out a layout for the card. 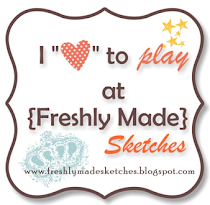 This is actually an old sketch from Lizzie Anne Designs. But it’s great for quick and simple cards. 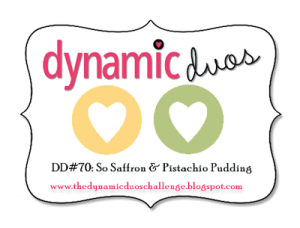 Posted by PH in VA at 8:00 pm Cards, Dynamic Duos, Stampin' Up! 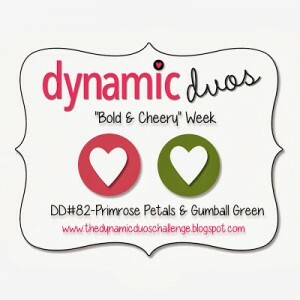 Today I’m combining the current Dynamic Duos challenge with Jeanne’s Hope You Can Cling To challenge to put a smile on someone’s face. In my opinion, there’s no way this darling little penguin can fail in making someone smile, especially with the bright, cheery colors. 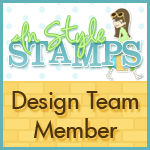 The layout is a really old OWH Stars & Stamps sketch that I dug up from the archives because I hadn’t used it before. However, I did take the liberty of turning the sketch on its side. That’s it for today! Thanks for stopping by. I hope you’ll come back again soon! So, here it is… pretty simple and straightforward. 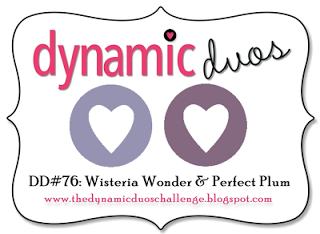 I masked off an area of the card and sponged Wisteria Wonder ink for the colored panel, and then sponged around the edges of the masked area with Perfect Plum ink. 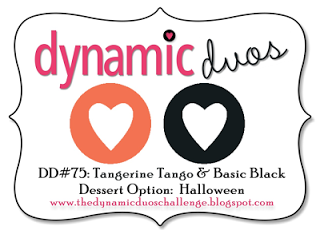 Today’s card combines the Dynamic Duos color challenge of Tangerine Tango and Basic Black with the Hope You Can Cling To “Let’s Punch Out Breast Cancer” challenge of using punches or die cuts. 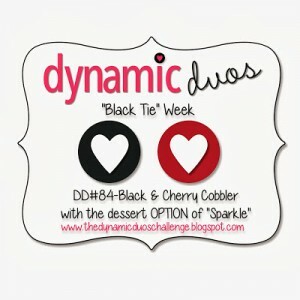 I just received the “hello” die a few days ago and this HYCCT challenge was a super opportunity to use it right away! I’ve used dies to cut three oval shapes, sponged them with tangerine ink, and assembled them to form a pumpkin. The pumpkin stem is the leftover punched from the letter “o” in the sentiment, with a bit of black and tangerine ink sponged on it. 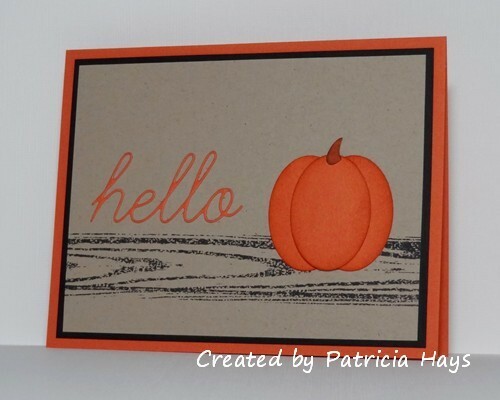 I used a woodgrain border stamp to create a shelf or a board or something like that for the pumpkin to sit upon, so it wouldn’t just seem to be floating on the card. OK, sorry for the corny punny post title. I just wanted to quickly get this posted and that’s the first thing that popped into my head. This card is for the current Dynamic Duos challenge using So Saffron and Calypso Coral. I went kind of “old school” on this one with retired stamps and a technique I haven’t seen much of lately. I’ve used the kissing technique for the background and for the big “U”. I wasn’t sure how the U would turn out, so I stamped it on a scrap of white cardstock and then fussy cut it to put on the card. 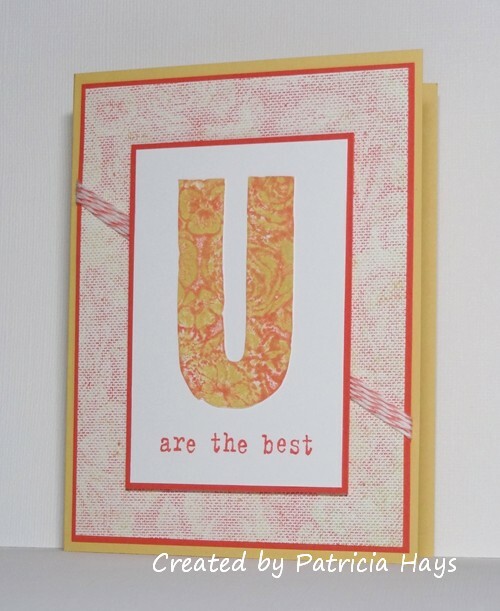 The card was too plain and flat and boring with just cardstock, so I found my matching twine. 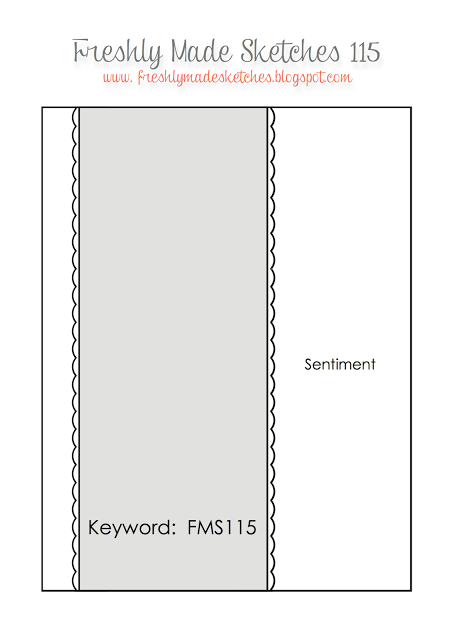 There wasn’t a whole lot of room to use it, so I decided to put it at an angle to give it a little more interest. Then I popped up the main panel over it with dimensional adhesive. 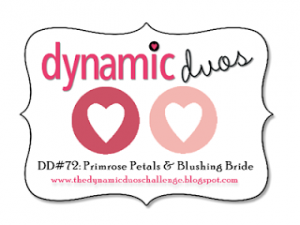 Posted by PH in VA at 8:30 pm Cards, Dynamic Duos, Stampin' Up! I’ve managed to combine several challenges for today’s card. 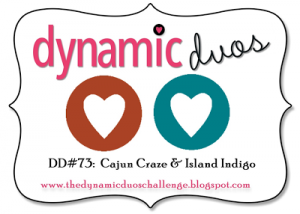 The colors are from the current Dynamic Duos color challenge of Cajun Craze and Island Indigo. I have to admit the colors had me puzzled for a while, trying to figure out what to do with them. Then I thought about how one of them is a rather good brick color, so I’ve used my brick embossing folder on a Cajun Craze panel and highlighted the texture by swiping my white ink pad across it. 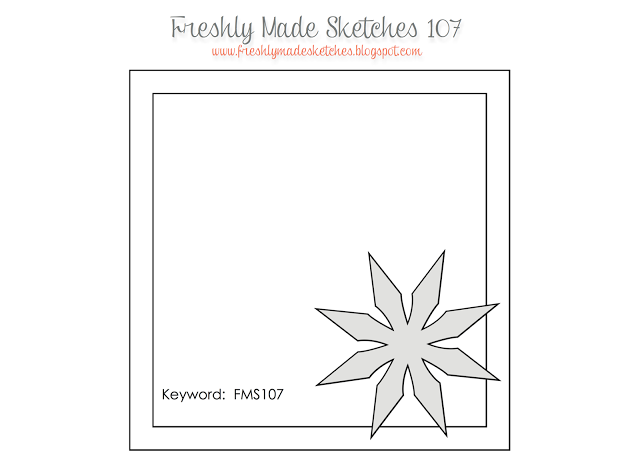 The current Freshly Made Sketches layout, rotated so that the embellishment is in the top left corner instead of the bottom right, lent itself to being a brick wall with a wreath hanging on it. (That’s not too weird, is it?) 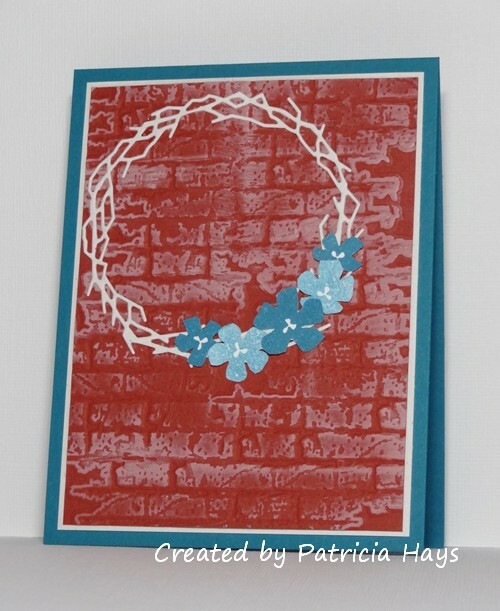 All of the flowers were stamped in Island Indigo ink, but two of them were stamped off once to get the lighter color. I trimmed the two on the ends down quite a bit so they’d be smaller than the others. Thanks for stopping by today! Comments are always read and appreciated! 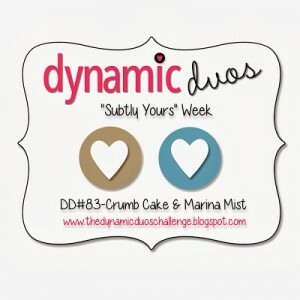 Today, October 1, marks the start of the Hope You Can Cling To challenge season at Splitcoaststampers.com. 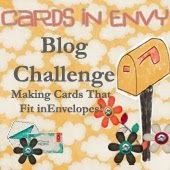 Each day throughout October, a new cardmaking challenge is presented. 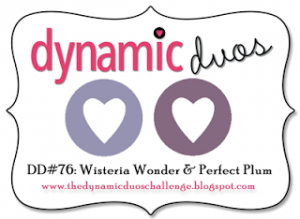 (Some days have more than one challenge!) 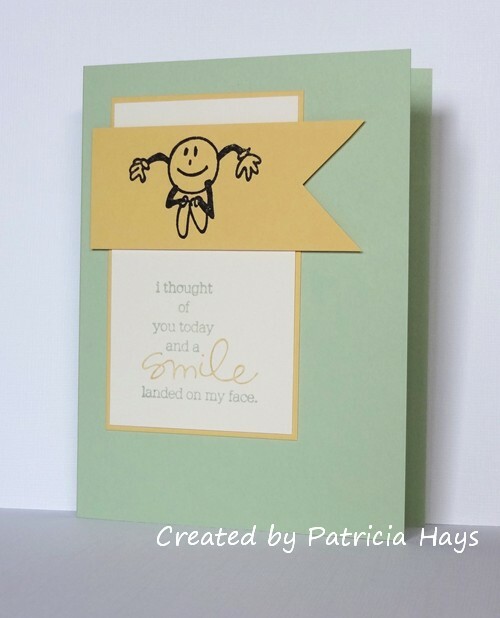 The crafting community makes cards according to the challenges, and the cards are donated to the MD Anderson Cancer Center in Houston to be used by cancer patients and their families. 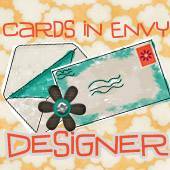 Cardmaking participants are eligible to win some pretty terrific prizes from various crafting companies. 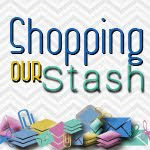 There’s a lot of fun and fellowship and crafty goodness involved, and it’s for a worthy cause! 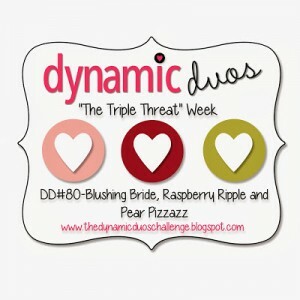 There were three challenges posted today. 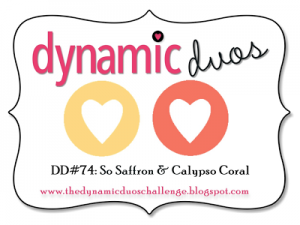 I’ve combined the “Flat is Fabulous” challenge to create a card with no lumps or bumps with the current Dynamic Duos challenge using shades of pink. 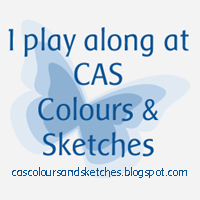 I used the same basic layout from last week’s CAS – Colours and Sketches sketch challenge. 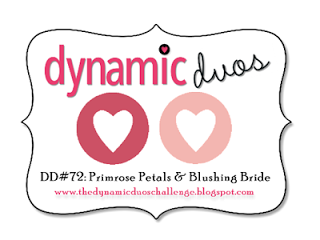 This time I masked off a diagonal area and sponged it with Blushing Bride ink before stamping the ribbon hearts in Primrose Pink. 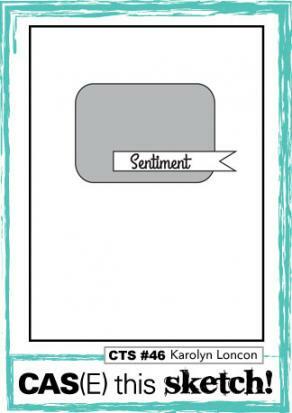 I added a sentiment and ta-da – I had an easy peasy clean and simple card that was quick to make. Thanks for stopping by today! I hope you’ll consider joining in Hope You Can Cling To! 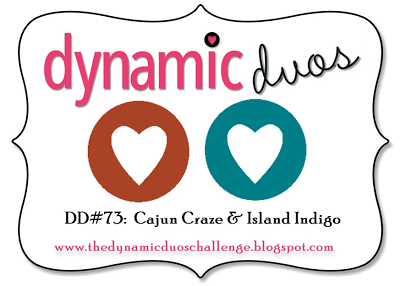 Today’s card is a quick and easy one I made combining Dynamic Duos challenge #71 with CAS(E) this Sketch! 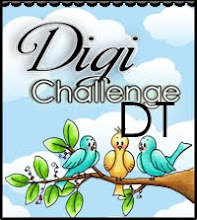 challenge #46. 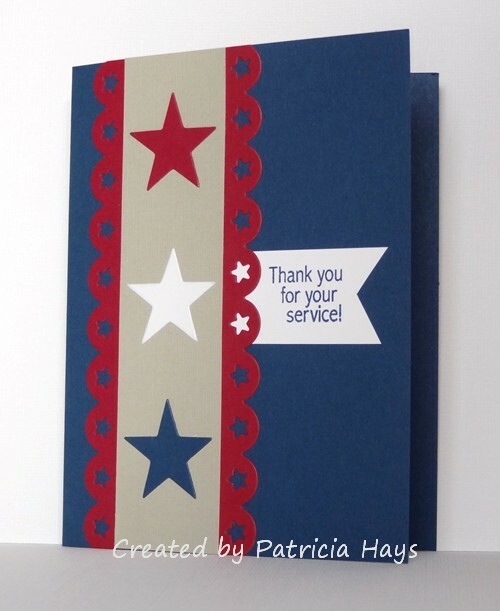 I figured this would make a cute card for one of our heroes stationed overseas to send home to a loved one. 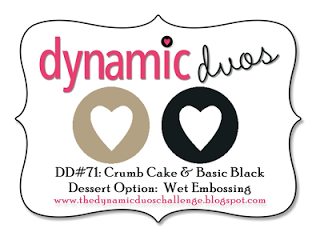 I considered including the Dynamic Duos “dessert option” of heat embossing, but I wasn’t sure how to tie that in with the rest of the card, so I ended up skipping that. I used my color spritz tool with a black marker to add a little extra speckle to the main panel, although it didn’t quite achieve the effect I wanted. Oh well. 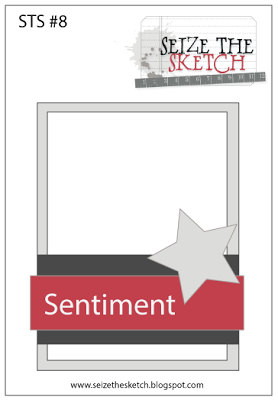 I decided to use a circle punch to cut the notch in the sentiment banner to kind of coordinate with the rounded corners of all the panels. There isn’t much else to say about this one, except for the details listed below. Thanks for stopping by today! 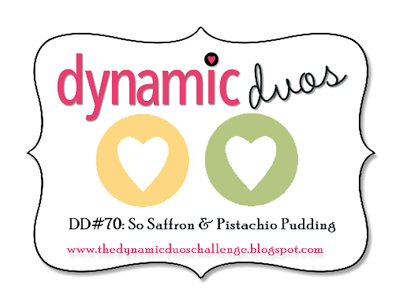 Posted by PH in VA at 8:00 pm Cards, CAS(E) this Sketch!, Dynamic Duos, Lawn Fawn, Operation Write Home, Stampin' Up! 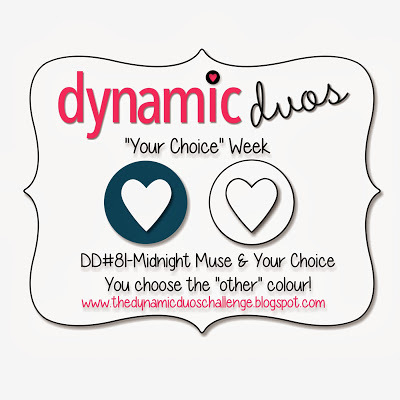 Today’s card is an embarrassingly simple one combining the current Dynamic Duos challenge with the current Freshly Made Sketches challenge. 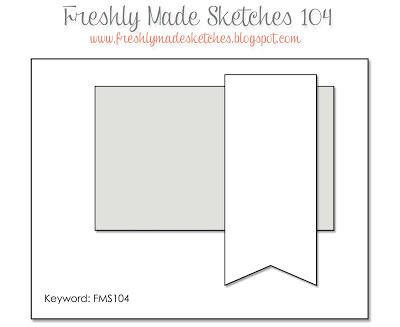 I’ve turned the sketch on its side and used a square punch to cut the fishtail banner. I wanted to make a few more “thinking of you” cards for Operation Write Home and this sentiment always makes me think of this image.